Glamis Castle in Angus, Scotland, is the home of the Earls of Strathmore and Kinghorne, the setting for Shakespeare's Macbeth, not to mention the beloved childhood home of the Queen Mother and the birthplace of Princess Margaret, so it made perfect sense for a royal enthusiast to go and visit, and my "now or never" moment came when I learned this year the castle was hosting a special exhbition of the 1937 Coronation robes. So off I trekked up to Angus in Scotland (I managed it as a day trip from London, should anyone be tempted to visit on a tight schedule). The castle as we see it today dates mainly to the 1770s, while most of the interiors date from the 18th and 19th centuries (unfortunately, there's no photography inside the castle, but I'd recommend a quick Google search, you won't be disappointed!). In 1034 King Malcolm II was murdered at Glamis, where there was a Royal Hunting Lodge. Tradition has it that William Shakespeare stayed at Glamis, and may have been inspired by tales he heard about the events surrounding King Malcolm's death to write his play Macbeth. The play was written for King James VI of Scotland after his accession to the throne of England as James I. The Bard himself wrote about Glamis: The castle hath a pleasant seat; the air nimbly and sweetly recommends itself unto our gentle senses. 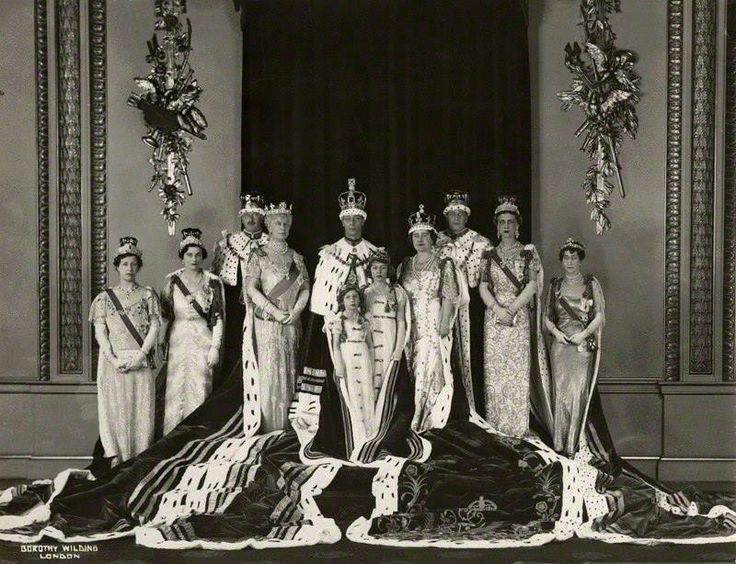 The highlight of my visit were the 1937 Coronation robes, which have been on display from 12 May, exactly 80 years to the day of the coronation, to 29 October 2017. The exhibition really felt like a must-see, as our guide told us that apparently the Queen has decided this is the last time the robes are to be publicly displayed, as they've become too fragile with age. So thank you Lauren (@parkysprincess) for sharing the photos of your own visit to Glamis on Instagram and giving me the spur I needed to make my way to Scotland! To learn more about how the exhibition took shape, you can read the official leaflet here. The dresses, robes and coronets on display are the Queen's personal property, and it was with her gracious permission that they were displayed at Glamis. The pieces were transported to Scotland by train by the Queen's senior dresser, Angela Kelly, who assisted in planning the layout of the exhibition. 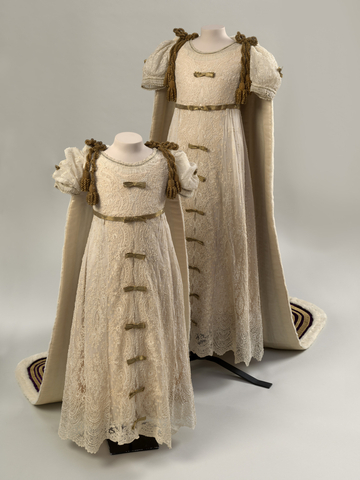 The traditional design has a combined cape and train; the white ermine shoulder cape is fastened on the shoulders with white satin bows and gold cord and tassels. The purple velvet train is 44 inches (1.1 m) wide and 18 feet (5.5 m) long. 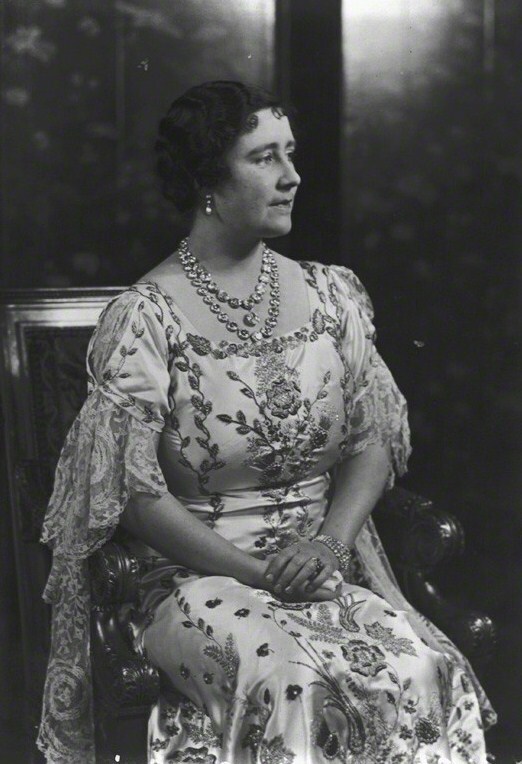 The train was borne by the Mistress of the Robes, the Dowager Duchess of Northumberland, assisted by: Lady Ursula Manners (the Duke of Rutland's daughter and the longest-lived among the Queen's attendants, she died on 2 November 2017 a week before turning 101), Lady Diana Legge (third daughter of the Earl of Dartmouth), Lady Margaret Cavendish-Bentinck (daughter of the 7th Duke of Portland), Lady Elizabeth Percy, Lady Elizabeth Paget (daughter of the 6th Marquess of Anglesey) and Lady Iris Mountbatten (the only child of the 1st Marquess of Carisbrooke and a great-granddaughter of Queen Victoria). The dress itself is bias-cut white satin with a square décolleté and slashed sleeves flounced with antique lace. 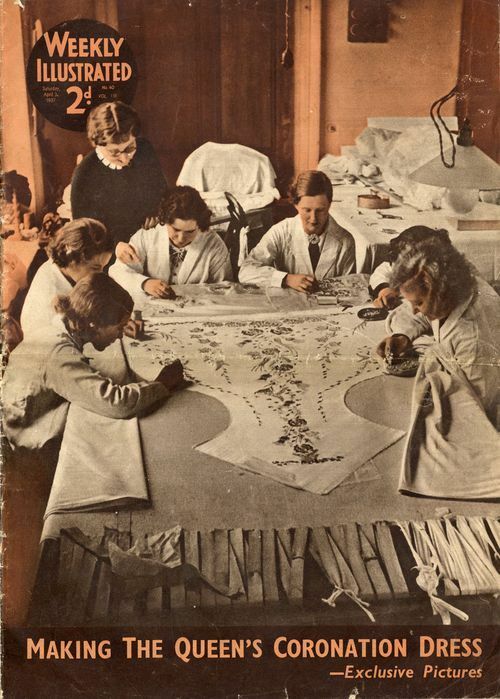 In keeping with royal tradition, it was embroidered by members of the Royal School of Needlework with diamanté emblems, again representing the same flowers and plants found on the train. 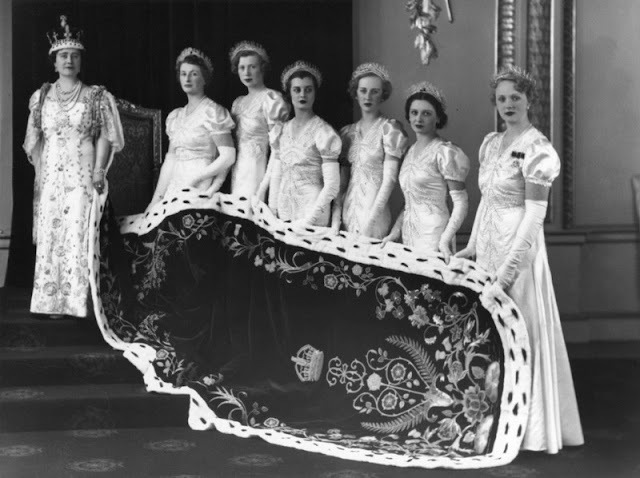 Three rows of gold lace used to run around the bottom hem of the dress, but these were later removed to be used elsewhere. 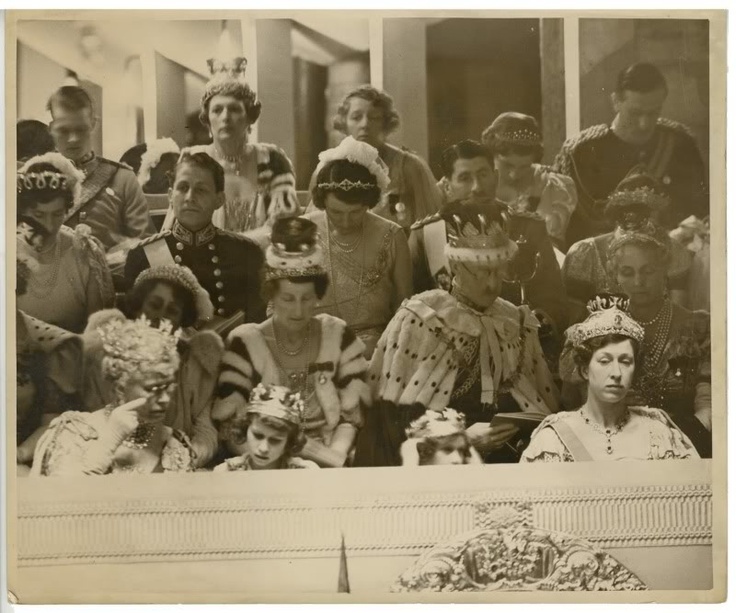 Both Princess Elizabeth, aged 11, and her sister, Princess Margaret, aged 7, attended the Coronation of their parents at Westminster Abbey. 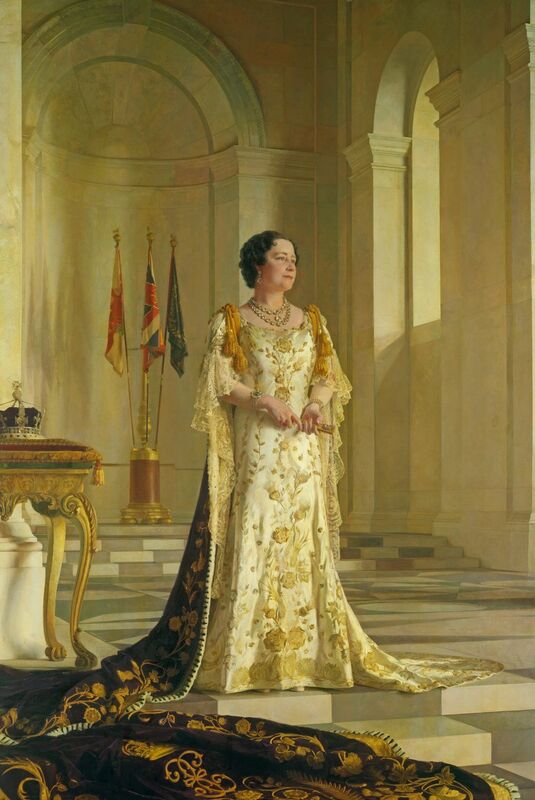 As princesses of the realm they wore dress as stipulated by the Earl Marshall, comprising of a cream dress with gold embellishment and purple robes, both made by Court robe-makers Ede & Ravenscroft. 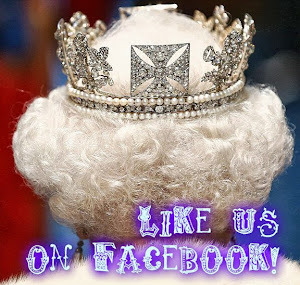 Their outfits were completed by silver-gilt coronets made by the Crown Jewellers, Garrard & Co. Ltd. 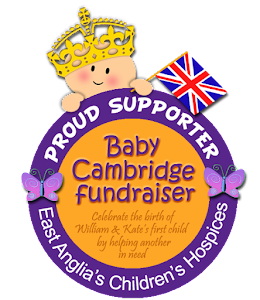 Originally, it had been decided that Elizabeth and Margaret should be given small versions of crowns to wear at the ceremony. Ornate coronets of gold lined with crimson and edged with ermine were designed by Garrard & Co. and brought to the royal couple for inspection. 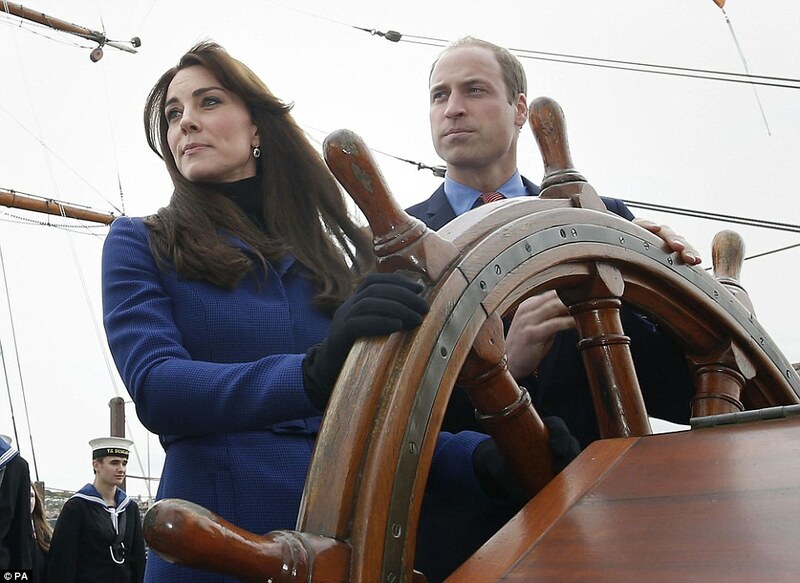 However, the King and Queen decided they were inappropriately elaborate and too heavy for the young princesses. 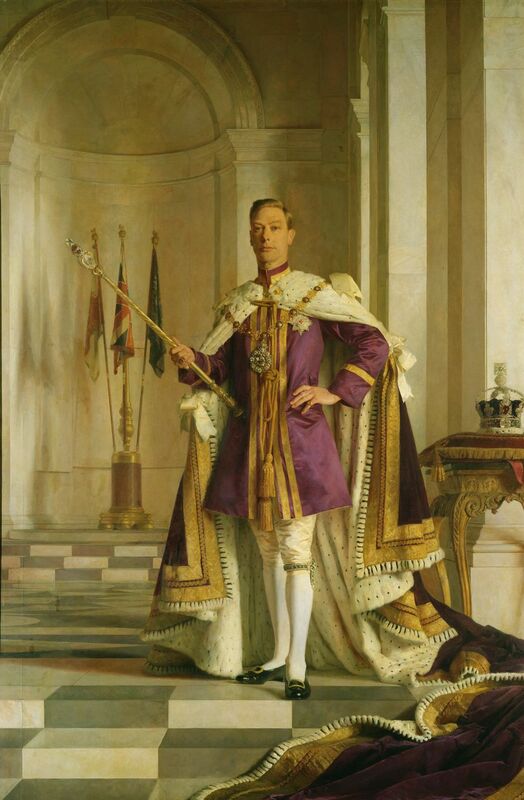 Kelly was initially commissioned to paint the state portraits in 1938. 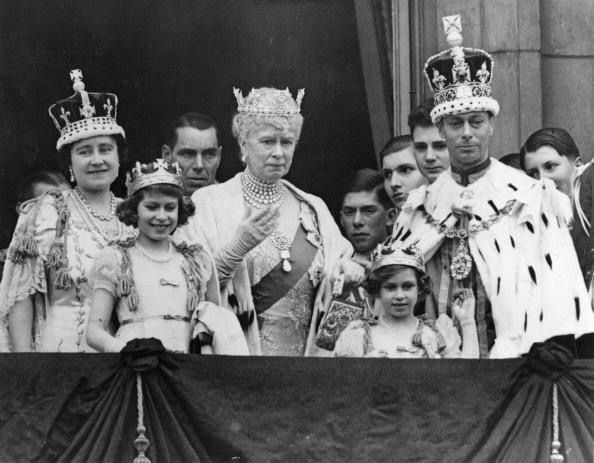 He started immediately and was nearly finished by the outbreak of the Second World War in 1939. The paintings were moved from his studio in London to Windsor Castle where he spent the next five years completing his commission. The backdrop of the paintings was originally intended to be the doors of the Crimson Drawing Room. Kelly later changed his mind and asked his friend Sir Edwin Lutyens to make a model, based on the Viceroy’s House in Delhi, which makes the paintings appear more spacious and stately. The exhibition also included the robes worn by the new Queen's parents, the Earl and Countess of Strathmore and Kinghorne. 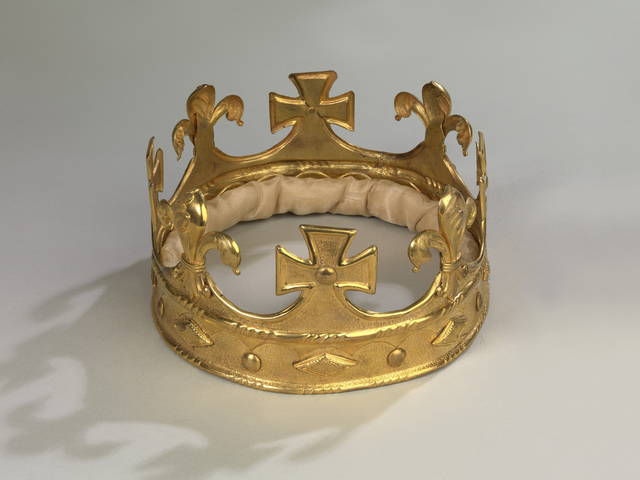 They witnessed the Coronation from a box directly above the tomb of King Henry VIII's fourth wife, Anne of Cleves, and opposite the burial place of King Richard III's wife, Anne Neville. The robes were worn at the Coronation of Edward VII on 9 August 1902 by the 13th Earl and Countess, and subsequently worn by the 14th Earl and Countess at their daughter's Coronation (and presumably also on 22 June 1911 at the Coronation of King George V and Queen Mary, although the informative panels at the exhibition didn't mention it).